Dog Eared Publicity is pleased to bring you Patricia Komar's JOBMOBBERS Book Blast January 30 – February 10! Link Aerospace Corporation recruits Dawn MacGregor right after she graduates from MIT. Thrilled, she moves to Boulder, Colorado, ready to start a brand-new life and career. Early on, however, strange things begin happening. Someone keys her car, and her belongings are moved around or go missing entirely. It seems some of her new coworkers have decided to sabotage her, and soon it goes well beyond minor damage and pranks. The mob targets her with actions that are increasingly dangerous, and Dawn begins to deteriorate psychologically and physically. As the world she once knew becomes a distant reality, the only constant in her life is a coyote that appears regularly just beyond the tree line across from her turn-of-the-century Victorian home, seemingly keeping watch over her. Dawn must try to put the jobmobbers in their place—before their bullying threatens her life. In this suspenseful novel, a woman faces vicious workplace bullies in a struggle that may end with her death unless she can find a way to fight back. 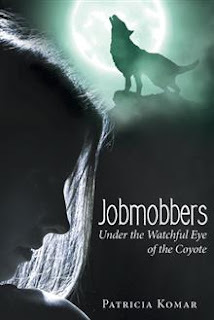 Freelance writer and author of Jobmobbers: Under the Watchful Eye of the Coyote, and The Ghost in the Hollows, Book One of the Hollow Hills Explorers Series. Book Two, Missing in the Hollows, will be published February 2016. Trainer of an intelligent and strong willed Blue Healer/Border Collie cross, but I often find myself asking, "Who's the trainer here?" And of course I'm a buddy to my Toto like Cairn Terrier, TABU, star of an article I wrote for Modern Dog Magazine.com EARTHDOGGING, CAN YOU DIG IT? University degrees from Switzerland, New York, Chicago, and British Columbia in the arts, writing, and psychology. www.patriciakomar.com Dancer, swimmer, hiker, and kayaker in training. Patricia is giving away a $25 Gift Card! This giveaway begins January 2 and ends on January 13. Winners will be contacted via email on January 14..